Fourteen peaceful protesters have done what no environmental organization in Montana had been able to do before: physically shut down the main corridor used to transport coal to the West Coast. Last Sunday, 14 people walked past a “no trespassing” sign in-between two railroad tracks in Helena, Mont., and temporarily shut down the main rail line used to transport coal through Montana to the West Coast. The action marked the culmination of months of preparation, as organizers in Montana decided on the best way to bring direct action against coal transportation to a new level. Although the occupation of railroad property itself lasted less than an hour, by the time it was over something had changed significantly for Montana’s movement to stop coal exports. This action began, as these things often do, with an unformed idea. 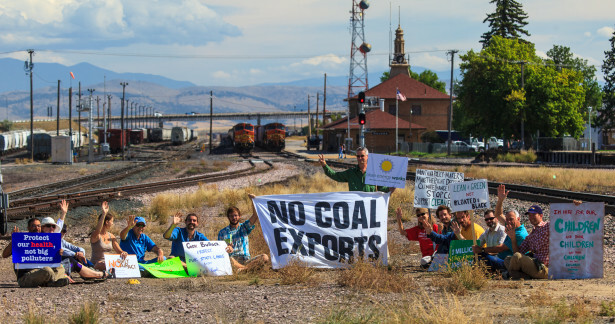 A group of organizers in Montana, including myself, thought it was time to bring peaceful resistance against coal export plans to the next level. Some of us had been involved in last year’s Coal Export Action sit-in at Montana’s State Capitol — a week-long action during which 23 people were arrested protesting state officials’ decision to lease the Otter Creek Tracts in Southeast Montana to Arch Coal. If built, the Otter Creek Mine would supply coal for export to international markets and be one of the biggest coal mines in North America. Not only that, it would put in place infrastructure that would make adjacent areas accessible to mining, paving the way for the transformation of rural Southeast Montana into an industrial coal extraction zone. Trains carrying coal from Otter Creek would add to local pollution in towns from Eastern Montana all the way to the West Coast. Burning all the coal from Otter Creek in overseas power plants would release more than 2.5 billion tons of heat-trapping carbon dioxide into the atmosphere. The summer that Arch Coal submitted its mining application (the next stage in the permitting process for the mine, after Arch got the initial lease from the Land Board), we held our sit-in at the Capitol. It became the largest act of climate-related civil disobedience in Montana history. Still, we knew it would take more than one action to win this fight. A group of us started talking about how to make the next civil disobedience hit even closer to the source of the problem. How could we plan an action that would directly interfere with the transport of coal through Montana, but which ordinary working people with few financial resources could realistically participate in? This last point was especially important. We did not have the backing of a well-funded organization. In order to be successful, we needed to do all we could to avoid draining legal suits that would make it difficult for everyday people to participate. Thus began an often-frustrating research phase of the planning process. We found that reports about the legal consequences of rail blockades vary widely. People have done it in the United States and walked away with nothing worse than a charge for misdemeanor trespass. But hanging over such actions is the threat of much heftier charges for blocking interstate commerce. At the end of the day, the charges faced by activists seem to depend at least partly on how much of a deal local law enforcement and the affected railroad company want to make out of the action. A company might decide that slapping peaceful protesters with felony charges is likely to generate more negative publicity than it’s worth. But there are seldom guarantees. In the end, we decided to keep our protest off the actual railroad tracks. We were dealing with a company — Montana Rail Link — that had never been the target of this type of action before. Knowing the fallout from a poorly planned action could set our movement back months, we decided to play it relatively safe. We planned an action that we hoped would accomplish some of the same goals as a rail blockade, without the severe potential legal repercussions. But what actually happened surprised all of us. On the day of the action, almost everything proceeded as planned. About 60 people rallied in a public park in Helena, then marched to a grade-level crossing where the railroad intersects a heavily used street. Fourteen people stepped across the railroad property line, symbolically reclaiming this land from the coal industry, while about 50 supporters cheered them on. It was an action we hoped would focus public attention on the way private companies profit off of polluting rail line communities, as state officials prepared to make their decision about whether to allow the Otter Creek Mine to be built. The 14 participants in the act of civil disobedience were a group of fairly ordinary people. They were college students and retirees, working people and grandparents. Most had never engaged in civil disobedience before, but earlier that day they had prepared themselves for the likelihood of arrest. While police and railroad security personnel looked on, the 14 protesters sat in a semi-circle in-between the two parallel railroad tracks. We waited to see what would happen next. It turned out that the Helena police were reluctant to take peaceful protesters to the already overcrowded city jail. In the end, they were cited for trespass, released and told to appear in court the next morning for arraignment. As news cameras flashed, they were led by the police off railroad property, and one by one were given tickets. They rejoined the larger group of supporters amid cheers and applause. It seemed the entire direct action was going pretty much the way we had hoped. But as the protest was wrapping up, something happened that made me realize we’d had an even larger impact than we had anticipated. A security guard stopped me (I was the railroad security liaison for the duration of the action) and asked if we were leaving now, because they’d really like to be able to bring trains through the area. That was when I realized we had actually shut down the rail line. Although the civil disobedience hadn’t taken place on the railroad tracks themselves, Montana Rail Link was unwilling to move trains through while a large-scale protest was taking place. Without expecting to, we’d apparently found a loophole in the complicated legal precedents that had confused us while we did our research. By deciding to keep people off the tracks, we avoided the worst legal repercussions of an action on railroad property. But we’d shut down the rail line anyway. Montana Rail Link’s line is currently the main route for coal trains moving from existing mines in Montana and Wyoming to coal export terminals in British Columbia. If coal companies succeed in building the Otter Creek Mine, as well as new coal export terminals on the West Coast, the number of coal trains on Montana Rail Link’s route will increase even more. But for the duration of the civil disobedience on September 15, any coal train trying to make it through Helena had to be held up. Fourteen peaceful protesters had done what no environmental organization in Montana had been able to do before: physically shut down the main corridor used to transport coal to the West Coast. What does this mean for the future of peaceful resistance to coal exports in Montana? Our September 15 protest was a more “direct” direct action against coal than had been tried in Montana before, at least on this scale. Our newfound knowledge of how Montana Rail Link and local law enforcement respond to peaceful protests on railroad property will almost certainly be useful to activists planning future actions. And there could not be a better time to put this knowledge to use, as the Otter Creek Mine fight comes to a head. Sometime in the next several months, Montana officials will likely decide whether to approve Arch Coal’s mining application — the last major piece of paperwork the company needs before it can start breaking ground on one of the largest coal mines on the continent. The permit is currently being reviewed by the Montana Department of Environmental Quality and, if approved, it must go before the State Land Board for a final vote. If those of us worried about coal’s contribution to climate change and local pollution want to stop this project, the time to organize is now. Blue Skies Campaign, the volunteer-run organization I work with, will be planning our next action against coal exports over the next few months. It may or may not involve a civil disobedience component — but regardless, it will be designed to put public pressure on Montana decision makers in new and creative ways. What’s different this time is we know what can happen when a group of everyday citizens decides to take on the coal industry at the point of transportation. On September 15, we found out that a couple dozen ordinary people can literally stop a coal train in its tracks. Now it’s time to take that lesson to heart, and apply it in even bigger ways. Happy to read this with two caveats. 2. The campaign only tells us what they are against, not what they are for. In my view it is important to accompany such actions with alternative energy plans (researched and costed) which should include jobs for those who won’t be getting them in the coal mine. Yes, this writer has really let it go to his head that they “shut down the railroad,” a phrase he felt needed repeated a few too many times. No, you did not “shut down the railroad.” What you did reveal, though, is that apparently the corporate and law inforcement authorities in your part of Montana are thinking people and not thugs. William, as the person who acted as police liaison at this action ( and who was arrested last August) I can confirm the “authorities” are not thugs. They are working people caught up in an unsustainable and undemocratic system, just like you and me. By thinking systemically, you come to understand that industrial capitalism reproduces itself by making us all dependent on its smooth operation. The organizers of this action and most in the climate movement understand that breaking free of this dependency is a complex, long-term process that begins with disobedience. I would like more information on your efforts. I have been working with the Northern Plains Resource Council about this very topic. We just presently testimony via video to the Army Corp of Engineers about the EIS they will be conducting for the port in Longview WA. I will be traveling with them to Spokane this Wednesday, again, to hopefully have the opportunity to testify. But I would like to stage a peaceful sit in here in Livingston, MT, perhaps as part of a correlated effort all along the rail line. This action is wonderful. A logical next step would be to travel to where the coal is burned and chain oneself to a coal-powered furnace. I’m confident the Chinese will see the error of their polluting ways. in other words we have built our country on coal but you inferior developing countries should not be allowed to due the same. in fact we strongly support birth control and abortion for all you wogs because there are too damn many of you as it is. that’s what i get out of this protest.